When you mention fixing a small bathroom or making a room bigger, people immediately think construction crews. But home maintenance doesn’t mean you have to take out the jack hammer and start tearing down walls. Sometimes, a simple a change in wall color or change in furniture can drastically alter a room’s appearance (i.e. size). With more space and added appeal, your home will obviously sell for more. This month, we’re going to talk about the bathroom. A lot of houses still have small bathrooms, which can be negative points when trying to sell. Cramped corners and tiny sinks don’t usually appeal to buyers, but with a few DIY (do it yourself) tricks, you can change all that. 1. Distraction — The eye is easily fooled, especially when it comes to perceiving space. An easy trick you can try to make your bathroom seem roomier is by adding a design element that leads the eye around the bathroom. Some examples include a tile band that wraps around the wall or interesting decorations that grab attention. One such decoration could be a bamboo ladder serving as a towel rack. It’s interesting. It grabs people’s attention, and keeps them from focusing on how small the bathroom is. Even if they do say something about the size, I bet you the bamboo ladder will still stick out in their mind later on. 2. Ambient Lighting & Mirrors — Proper lighting is key to making any room seem big, and since bathrooms tend not to receive much natural light, you have to use the right bulb to convey the right idea. Fluorescent lighting can seem sterile and blinding at times, so it’s usually better to use a softer light tone. Mirrors also help tremendously because they make rooms look bigger with their reflections, and they help spread the light. 3. Division — Small bathrooms can be a little too cozy at times. They usually run a pattern of sink–toilet–shower. There isn’t any “room” division of the items (usually space creates that division). So, an easy trick you can do is add a “wall.” I’m not talking build a wall, but add a piece of furniture that breaks up the monotony. Artistic wall reliefs, like in the picture to the right, help create a “room” for the toilet without blocking light. It’s adds dimension and makes the bathroom eye appealing. You probably don’t even notice how small the bathroom is. 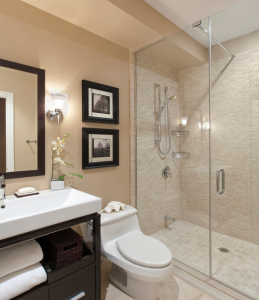 After a few touch-ups, you can have your small bathroom serve as the main selling point of your house. It’s all a matter of creative design and use of furniture. Every bathroom is different of course, and you should evaluate the situation for yourself. But always keep in mind how easy it is to transform perception and sell even the worst parts of your home. If you have more questions, feel free to contact me or read our other articles.